This tense is used to express that an action will continue for sometime in future and will not be complete. In this tense time limit for continuity of activity is also given. This tense is scarcely used for practical purposes these days. In this tense 'Shall or will' and 'have been' and first form of verb with 'ing' are used. For expressing time 'since or 'for' is used. For example : He will have been taking exercise for two hours tomorrow. 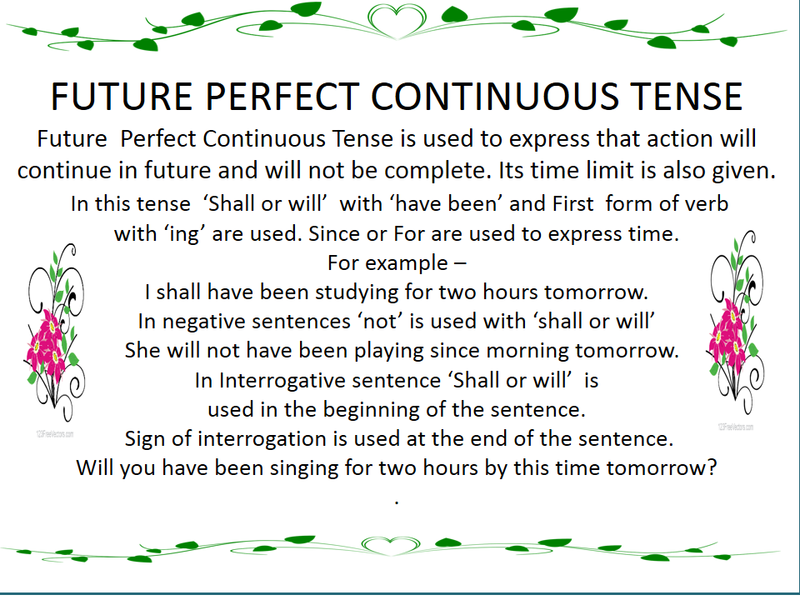 In this tense with -- shall or will + have been + first form of verb & ing is used. For showing time -- Since or for is used. Since is used for a point of time & For is used for duration of time i.e. Since morning, For two hours. We shall have been living here for the last two years. The boys will have been making a noise since 1 p.m.
You will have been doing your job for three years. 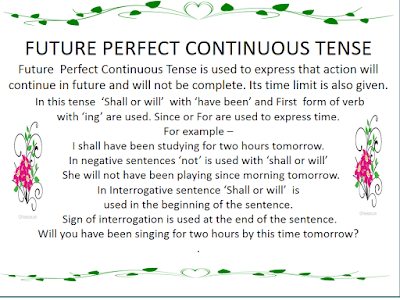 In these sentences with ‘shall or will + have + not + been + first form of verb & ing is used. For showing time --- Since or For is used. I shall not have been reading my book for two hours. You will not have been singing since morning. They will not have been doing their work since morning. In these sentences--- shall or will is used before subject. And - have + not + been + first form of verb & ing is used. To express time 'Since' or 'for' is used. Shall we have been playing a match since morning? Will you have been taking this medicine for a week? Will he have been staying with you for a year? Similarly in interrogative negative sentences ‘shall or will’ is used before subject and not & have been is used before first form of verb and ‘ing’ in the sentence. To express time 'For' or 'Since' is used. Shall we not have been entertaining the guests since morning? Will you not have been flying kites since morning ? Will the birds not have been flying in the sky for two hours? 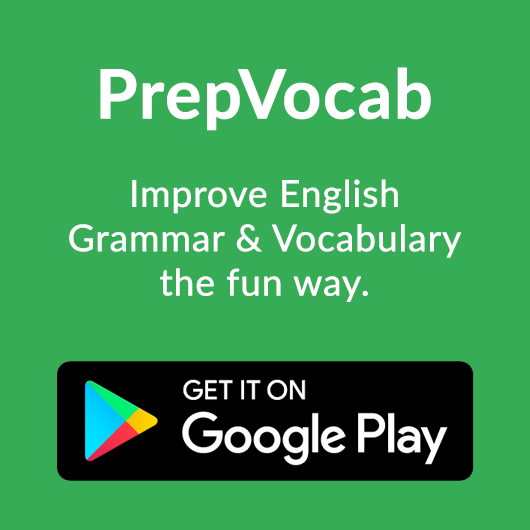 In case of interrogative sentences with words starting with 'wh' , the word with 'wh' is used in the beginning of the sentence followed be shall or will have been and first form of verb with 'ing' . In negative sentences 'not' is used after shall or will. In case of 'Who', shall or will have been or shall or will not have been are used after the word 'Who'. Following sentences will clear the point. Why will the child have been crying for such a long time? For how many years will you have been living in this house? Who will have been teaching the students for the last two hours? 1. The teacher..........(teach) the students ....... the last two hours. 2. Children .........(play) in the garden......... morning tomorrow. 3. I ..........(study) in this college ........the last three years. 4. You ........(swim) in the swimming pool ...... two hours. 5. My brother .......... (work) in this factory for two years. 1. Women ..........(not carry) water from the village well ..... morning. 2. Your sister ........... (not draw) a picture ......... 2 p.m.
3. You ...........(not live) in this colony ......... the last one year. 4. She ...........(not drink) milk ........ the last few months. 5. My mother ........ (not worship) in the temple .....7 a.m. 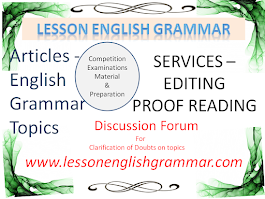 Fill in the blanks using appropriate form of given verb in Future Perfect Continuous Tense. 1. ..........my mother ...........(wait) for me ........four hours? 2. ......the boys ...........(play) cricket in the ground .....morning? 3. ........the teacher..........(teach) the students ....one hour? 4. ...........you .........(paint) a picture ........noon? 5. ........the child ........(sleep) ....... the last one hour? 1. Why ........ the children ........ (make) a noise ........ such a long time? 2. Who....... (impart) training to the apprentice ..........two weeks? 3. From where ,,,,,,,,the villagers .......(fetch) water ....... the last fortnight? 4. Whose biography ....... he .......(write) ...... the last six months? 1. The teacher will have been teaching the students for the last two hours. 2. Children will have been playing in the garden since morning tomorrow. 3. I shall have been studying in this college for the last three years. 4. You will have been swimming in the swimming pool for two hours. 5. My brother will have been working in this factory for two years. 1. Women will not have been carrying water from the village well since morning. 2. Your sister will not have been drawing a picture since 2 p.m.
3. You will not have been living in this colony for. the last one year. 4. She will not have been drinking milk for the last few months. 5. My mother will not have been worshiping in the temple since 7 a.m.
1. Will my mother have been waiting for me for our hours? 2. Will the boys have been playing cricket in the ground since morning? 3. Will the teacher have been teaching the students for one hour? 4. Will you have been painting a picture since noon? 5. Will the child have been sleeping for the last one hour? 1. Why will the children have been making a noise for such a long time? 2. Who will have been imparting training to the apprentice for two weeks? 3. From where will the villagers have been fetching water for the last fortnight? 4. Whose biography will he have been writing for the last six months? 5. How will she have been pulling on with him for all these years?